It all began in 1995 – eBay was originally created as a tech company in Silicon Valley, but it gradually became one of the largest eCommerce websites in existence. 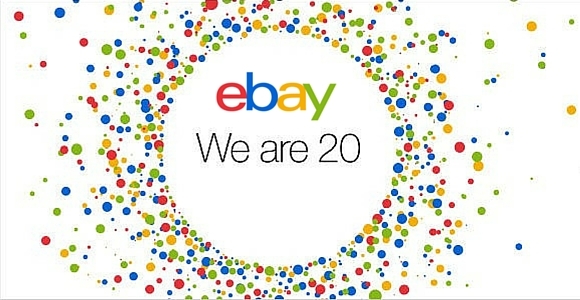 On September 9, eBay began celebrating its 20 year anniversary, and the “20 Days of Deals” promotion accompanied this celebration. In other words, eBay shoppers are entitled to a variety of discounts during this promotional period. For anyone who loves going on a shopping spree, this is a golden opportunity to feed his or her appetites. Furthermore, sellers are incentivized as well to offer as many products as possible, so that the celebration can be absolutely successful. As shoppers will use this 20-day window to enhance their wardrobe and gadget arsenals, it is a great opportunity for sellers to attract more customers with enticing deals. There are many advantages to this sale, but the ones who can truly utilize it are business owners. So, here are a couple of suggestions on how to truly profit from this massive sale. This is a golden opportunity to sell items galore and make the best of the upcoming shopping frenzy. Although, as a seller, you will have to offer a discount, the point is that you can collect a lot of positive reviews and eventually become one of eBay’s top sellers. After all, running a successful business doesn’t just mean offering – good deals, reputation has a significant impact as well. In other words, you should use this period to your advantage and make an important step towards growing your business. This is also a good way to deal with the problem of overstocking, if there are items you could not sell so far, they are likely to be picked up in this shopping spree. This is perhaps the greatest advantage of this anniversary, people will spend more time on eBay than usual, and since online shoppers are not in a hurry, your items are very likely to get noticed, as long as you make compelling offers. So, if some of your items remained unnoticed before, now is the chance for them to emerge from the shadows and find their owners. Basically, if you are a seller and activate offers followed by listing in the auction-style format, as well as fixed price, or Buy It Now format, you won’t be obliged to pay an insertion fee, and you will get a 20% discount on Final Values Fees. This applies for up to 20 items you are selling during this promotional period. As you can see, this is a mutually beneficial deal for buyers, and sellers. The offer is activated via e-mail, and any seller is eligible to do so, as long as he or she meets the minimum seller performance standards. So, if you do not have an account as a seller you will need to register first. It is also worth mentioning that there are some restrictions to these offers. Categories that are excluded from the sale are Vehicles, Power Sports, Other Vehicles, Motorcycles, Boats Motors Local Market, Heavy Equipment, Concession Trailers & Carts, Real Estate, Classified Ad listings, Imaging & Aesthetics Equipment, and Commercial Printing Presses. If you are planning on selling in bulk, then you should make your offers appealing to both small and large business owners. They are always interested in revitalizing their office space by getting new furniture and equipment. Also if you are selling technology, tech bloggers are always on the lookout for new products they can review, so the items that did not have a chance to be thoroughly examined so far are likely to be sold now. If you sell clothes, you are very likely to sell an incredible amount of items. Clothes on discount often cause riots in stores, but when it is online it is way more peaceful, and people will finally get a chance to shop without getting trampled. The good thing about selling clothes is that people want to make the best out of discounts, so even when they do not find something they like the best, there is a good chance they will buy an item because of the low price tag.